A new week has kicked off at Casumo, and you know what that means: exciting new slots and epic Reel Races. Try your luck on popular slots such as Bonanza, Ark of Mystery and Big Bad Wolf, and battle the other players for a top prize of £2,000 in real cash! Casumo’s unique Reel Races are one of the concepts that makes the site one of the best online casinos in the world. They elevate the fun with slotting to a new level, and in addition to playing against the casino you will be battling other players for a shot at taking down enormous cash prizes. The goal is to earn as many points as possible during the race by hitting consecutive wins and big wins on a specific slot. You can learn everything you need to know about Reel Races over at Casumo. There are new thrilling Reel Races starting almost all the time in the casino, and below is an overview of the special races of this week. Each race starts at 20:00 CET (except for Tuesday’s race), and the top prize in each race is £2,000 in cash. Play three superb slots from Quickspin, an unbeatable favourite from Big Time Gaming, and the classic slot Gonzo’s Quest. Make sure to come back on Sunday at 18:00 CET as a new race on a NetEnt slot kicks off every hour. This Sunday you compete on games such as Jumanji, Coins of Egypt and Mega Fortune! We’re only in the beginning of the month, but the game releases are already starting to pop up. You can try out four new slots at Casumo this week: Epic Joker, Vegas Diamonds, Almighty Reels: Garden of Persephone and Reel Talent. Find them in the games lobby and see if you will discover a new favourite! And if you’re not a member at Casumo yet, you have a fantastic welcome offer waiting for you. On registration you will receive 20 no deposit bonus spins on Starburst with a wagering requirement of x30. And on your first deposit can get a 100% bonus up to £300 with a minimum deposit of £10. 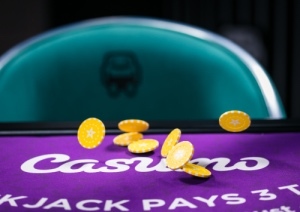 The bonus and bonus winnings have a wagering requirement of x30, and please make sure to read the full bonus terms and conditions at Casumo before playing.